Keeping kids entertained on long journeys can be a major challenge – but Toyota has just won an award for a new theoretical technology that aims to solve the problem. 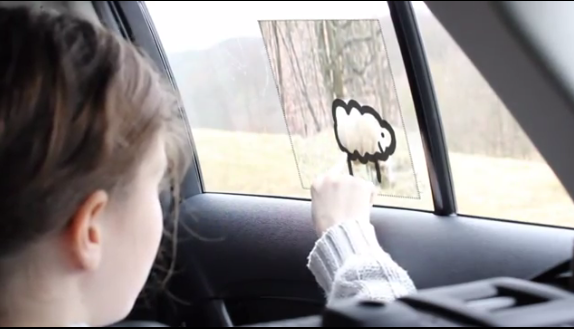 Inspired by the way in which children doodle shapes in condensation covered windows, the so called “Window to the World” concept turns a car’s glass area into a fully interactive canvas. The idea has been judged so good it’s now won a prestigious design award. The Window to the World concept took top honours in the Speculative category at the 2012 Core77 Design Awards this week. Created by engineers and designers from the Kansei Design Division of Toyota Motor Europe and the Copenhagen Intitute of Interaction Design (CIID), the concept uses augmented reality technology. Central to the concept is a system that allows passengers to use their fingers to draw pictures on the windows. These images could be saved or coloured in. Other features include the option to turn a panoramic roof into a star map, or have the windscreen display distances or directions. The technology also allows passengers to find out information about their surroundings. 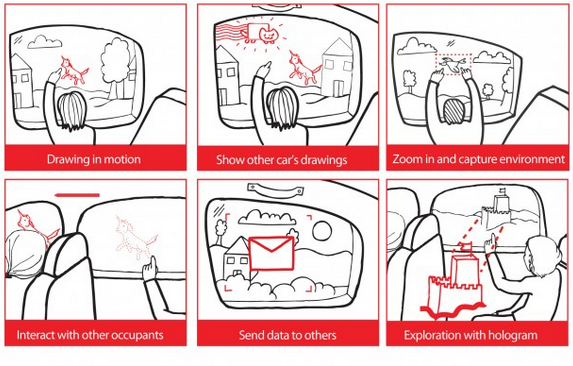 You can zoom in on particular views, or share information with similarly equipped cars. Take a look at this video to see how the technology could work. Please note: this video was filmed in a static studio environment and uses visual effects to convey movement and display how the technology could work. We recommend that seat belts are worn at all times. Find out more about the technology here , or read more about the Core77 awards.